Oia, the most picturesque village of Santorini, provides an excellent view of the well-known sunset, probably the most famous sunset in the world! People from all over the world visit Santorini in order to photograph it and, most of all, cherish it. The sunset in Oia holds a whole different meaning. It is the time of the day when you can experience a brand new sensation. All visitors and locals gather in streets, stairs and rooftops in order to cherish the sunset. It is like a big celebration, which takes place every evening anew and ends when all people together, as a big company, clap their hands the moment the sun dims in the sea. 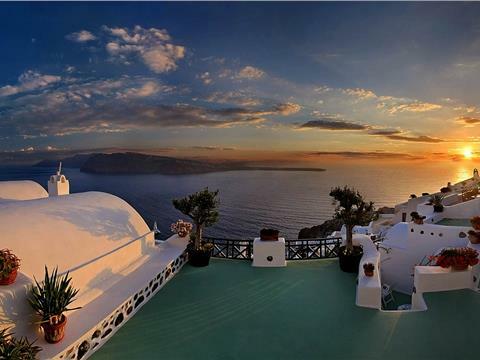 The sunset colors complete the extraordinary beauty of Oia and offer you an unforgettable sight! You can really feel the special energy and the sunset is just magical! It is definitely worthwhile catching the sunset here. Departure point: There are pre-defined pick-up/drop-off locations, chosen at convenient central spots in most villages. You will be advised after the booking, a pickup location that is closest to your hotel or most convenient for you! Pickup info: The pickup time is approximately 3 hours before the sunset. Sunset in OiaVisit Oia village to enjoy the amazing view to the volcanic islands and the famous sunset. Definitely recommend. We stayed in Oia and they made arrangements to be picked up from Oia and drop us back at Oia. The inside tour at Akrotiri was with the same guide but had to pay separately. The kids under 18 are free. They take you to Kamari beach where we can have lunch, they recommend you the restaurant which is great but you've plenty of other options as well. The restaurants are very reasonably priced and you've an option of taking the lunch by the beach side. The only thing is... its too windy. Another thing we enjoyed was the wine tasting tour, one of the best places on the island and top 10 places for best wines in the world...I would recommend taking this tour on the first day, that way you know the entire island and then the next day we went to the places we wanted to visit... Take the caldera boat tour on the next day that will take you to the volcanic mountain and if you like trekking and hiking, they take you all the way to the top of the volcanic mountain and check out the craters (it's an active volcanic site, the last eruption was in the 1940s). , A great experience!, Excellent!, A great experience!, A must do., Our guide was awesome! Thank you very much for your review. We are more than happy to know that you enjoy our tour. I just want to clarify that you went at Perissa beach. Kamari beach is seen from prophet Elias Mountain. Our goal is to enjoy every minute of our tours on the island and to offer you a unique experience. Everything was organized. Our guide was very knowledgeable and answered our questions. The driver was excellent. Thank you for your comment! We are more than happy that you enjoyed our tour! Very informative,very friendly. Value for money, A great experience!, Excellent!, A great experience!